Michelin has promised tyres that will let grand prix drivers race flat out at all times if it wins the tender to supply Formula 1 from 2017. Many drivers dislike the current Pirelli tyres, which they have to manage to required race distance by driving within themselves. "Michelin could really help the sport come back to its origins," said Michelin competitions boss Pascal Couasnon. He said its tyres would be three seconds a lap faster and make drivers "happy to express their talent". Couasnon added: "I don't want to talk about Pirelli but at least the philosophy Michelin brings is high, stable performance for a given lifespan." Pirelli, which is in competition for the tender with Michelin, says it is only producing the tyres it has been asked for and can build any tyres F1 wants. But drivers and senior engineers in teams privately express their doubts about whether Pirelli could produce more durable tyres even if asked to do so. Pirelli introduced this new approach - tyres that need to be carefully managed - at the behest of F1 commercial boss Bernie Ecclestone when it was appointed the sport's tyre supplier in 2011. Ecclestone wanted races in which drivers had to do multiple pit stops because he regarded that as a better spectacle. But disquiet has grown over the past few years and earlier this month F1 bosses agreed in a meeting with the drivers and Pirelli to reconsider the philosophy. Ecclestone has been supportive of Pirelli and critical of Michelin, saying the French company would bring tyres that "you put on in January and take off in December". Couasnon says part of Michelin's bid has been to explain to Ecclestone why it thinks its approach to tyre design could improve the spectacle of F1. The two parties met recently as part of the tender process. Speaking in an exclusive interview with BBC Sport, Couasnon said: "We explained that we were not opposed at all to bring technology to increase the show. So multiple pit stops is something we are not against. "We pretty much explained our philosophy, which is let's bring a tyre that helps the drivers to drive 100%. "Let's have a tyre that gives the teams the possibility to have different strategies and let's bring a tyre which is closer to what we see on the market, but which also technically brings better performance." Couasnon said there had been confusion over what Michelin meant when it said it would produce a "durable" tyre. "We mean a tyre that you can push to the limit for a given time," he said. "We could offer, let's say to be simple, two options - one option where you can do a lap time and the tyre can do, say, half of the race; and another tyre which would have slightly less performance where you could run three-quarters of the race." While the Pirelli tyres general lose pace and grip on successive laps, Couasnon says the Michelins "would keep the performance for the entire length of the stint". He added: "We know we can do that, because we do that every race in the World Endurance Championship." Couasnon said he had met leading teams in recent weeks to allay their concerns about another aspect of Michelin's tender - a desire to use bigger wheels to make F1 tyres more relevant to road cars. F1 cars currently use 13-inch wheels but Michelin wants to increase that to 18-inch, which is typical of the size used on higher-performance road cars. F1 engineers felt this would be a mistake for the sport because it would actually make the cars slower, but Couasnon said that belief was based on a misinterpretation of what Michelin wanted to do. The company wants to use taller tyres in addition to the bigger wheels, so although tyre sidewalls would reduce in size it would not be by as much as was first thought. He says Michelin's experiments on a car from the Formula Renault 3.5 feeder series prove this would immediately give a gain of one second per lap over running 13-inch wheels. "At one point, maybe people thought we would go for the bigger wheel and the same outside diameter of the tyre," Couasnon said. "If you do that, obviously you go to a very narrow sidewall, you have a smaller air box - a tyre is an air box - and then you have to increase the pressure to be able to use the tyre and therefore lose some performance. "That is not our proposal. Our proposal is to go with a very big tyre, so the tyre would be higher than the current one. "Although the sidewall would be not as high, they tyre would be able to function at pretty much the same pressure as today. "By doing that, you have a tyre that is more direct because the sidewall is a stronger spring and then your footprint is much more efficient." Michelin wants to use in F1 tyres of 72cm diameter (28.3in) rather than the current 66cm (26in) diameter. This plan would mean the sidewalls of F1 tyres would reduce by only 3.8cm (1.4in) from the current size. Some engineers have expressed concerns about changing the size of the wheels because of the effect it would have on car design, given much of the suspension movement of an F1 car is a function of the tyre. But Michelin argues, first, that because the tyre sidewall is not changing as much as teams thought, the effect is much reduced and, second, that since F1 bosses are working on new rules for 2017, which include using wider tyres, the cars will need a redesign on this basis anyway. Couasnon added that reducing the height of the sidewall in the manner he suggests actually improves performance. "One thing which is very interesting if you want to be technical is that with a stiffer sidewall - and it is stiffer because it is not as high - you have less deformation in the sidewall," he said. "Therefore, you can control better the height of the car and run it even lower compared to today and that gives you performance, and we are not even taking that into account in the performance gain we declare. "So we are talking about more than two seconds [in lap-time gain from the tyres], plus what you could gain with a different setting of the car." 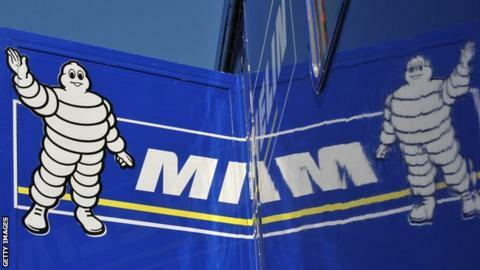 Both Pirelli and Michelin have had their tenders approved by governing body the FIA on technical and sporting grounds. The final decision now lies with Ecclestone. Pirelli pays Ecclestone's Formula 1 Management company (FOM) $40m (£25.75m) a year for extensive trackside advertising. Insiders believe the 84-year-old will base his final decision on tyre supplier purely on the financial gain for the sport's owners. Couasnon said: "Obviously we are aware of the importance of the commercial side and we will make a proposal which makes sense to us. Hopefully it will make sense to everybody but I am sure it will be part of the discussions we will have." Why does Michelin want to enter F1? Michelin pulled out of F1 at the end of 2006, after winning two consecutive titles with Fernando Alonso and Renault. At the time, there was some bad feeling between F1 bosses and the tyre company after the debacle of the 2005 US Grand Prix, when Michelin had to withdraw on safety grounds and only six cars on Bridgestone tyres were able to race. So why does Michelin want to come back? "It is important because it is the pinnacle of sport," Couasnon says. "It is a very technical series but we have to say that today we don't consider F1 to be the most technical series for tyres. "We would love to contribute to the sport to come back and be very useful for the tyre industry. "If we are not chosen, it is not the end of life for Michelin, because we are involved in many very interesting series. But being involved again in a very visible and attractive series would be nice." He added that although the full details of Michelin's tyre offering have not been finalised, it would be looking to bring in revolutionary technologies. One example of these is a tyre used in the World Endurance Championship (WEC) which has no tread but can be used in damp conditions - a so-called 'slick inter'. Drivers in the WEC have expressed amazement about how this tyre performs in giving grip on a damp track despite having no grooves in it.